With our specialty moving services serving the Chicago, IL area, Chicago Office Movers can provide the solution you need to move each and every item to your new location. Our precision timing and professionalism involved with handling fragile and/or heavy equipment has made us one of the leading commercial movers in the Chicagoland area. One of our moving representatives will work with you to determine exactly what you will need, your budget, help your staff plan, and educate your employees so everyone can be ready on moving day. Whether you’re looking to move antiques, inventory, science and lab equipment, or large furniture, you can count on our union movers to get it there in the same condition it was in before leaving. Ultimately, with our expertise, you can expect to have a stress-free move. Storage Services – Our climate-controlled warehouse features over 60,000 square feet of storage space, perfect for keeping your items secure until your new location is ready. Paperwork Storage – We understand that company files must be kept confidential, but keeping them on-site can be costly. Allow our professionals to take care of this for you, keeping them safe from fires and theft while being readily available to you upon request. 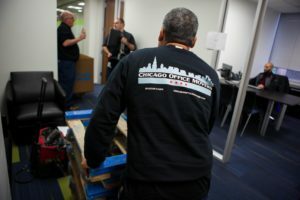 Packing – Allow Chicago Office Movers to take the stress out of moving with our professional packing services. After years of packing belongings of all shapes and sizes, we can organize and carefully fit everything to prevent damage during the relocation process. Crating – Instead of using cardboard boxes, this environmentally friendly option can provide more efficiency to the packing process. By simply packing and stacking these crates, we can speed up the moving process, minimizing the overall time so you can start enjoying the benefits of your new location sooner. Furniture Assembly – When large furniture comes in numerous pieces, tools, screws, and nails can become lost, or the furniture is damaged during the relocation process. But our professionals will organize everything to prevent the loss of these pieces while quickly assembling all furniture. This will be done as other items, boxes, and crates are moved in. Add On Services – In addition to our specialty services, you will have the option to customize your moving service by adding on other services like shredding, decommissioning, decluttering, and more in order to provide additional convenience for you on moving day. Whether you are looking to store some of your belongings until your new location is ready, or just need your furniture moved around during building renovations, you can count on Chicago Office Movers to get it done for you in an efficient manner. Each of our movers is also trained, licensed, and background-checked to serve you with utmost professionalism while handling your items and furniture as if they were our own. Our moving resources allow us to move large and heavy items without causing damage so you can take them with you to wherever you go. Our services can also be customized, allowing you to pick exactly what you need while staying within your budget. For more information on our specialty moving services or a free estimate on one or more listed above, please call Chicago Office Movers at 312-244-2246 or fill out a contact form. We look forward to serving you soon! We highly recommend Chicago Office Movers for your next move. We are so very apprciative of their professional responsiveness, competative pricing and expert service. We moved our wealth management firm's offices recently and Chicago Offcie Movers did exceptional work in a very effcient manner. I will use them again for all of our moves in the future.